Nothing is better than drinking pure water, right? It's healthy, refreshing, natural and pretty much free. What's not healthy nor natural though is all of the contaminates and nasty stuff that you can't see in the tap water you drink. Drinking tap water is something most of us do with the exception of those who are fortunate enough to get natural spring and mineral water, so why not use something that can filter out all the bad stuff and leave you drinking cleaner, tastier tap water? Cue the Bobble bottle. This is not an ordinary water bottle, its got a built-in replaceable carbon filter that filters out all that crap in today's water as you drink. The Bobble's filter removes the awful taste of tap water, chlorine and other contaminants in drinking water behind so you end up drinking cleaner, odorless, better tasting water. Or at least that's the claim. 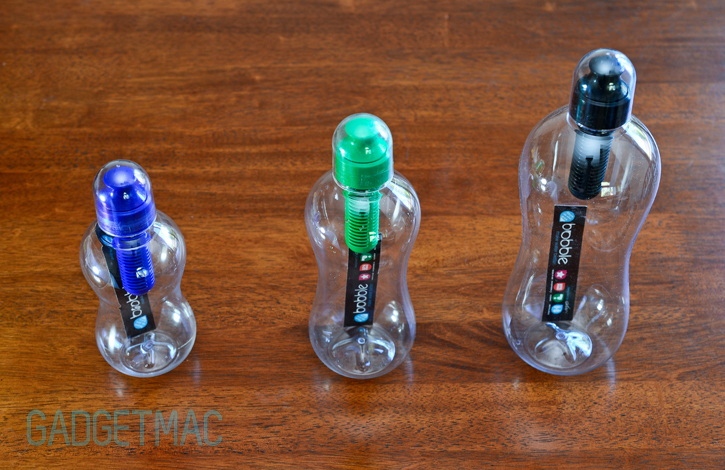 We taste tested the Bobble's claim to fame and drew a surprising result. If you live in the city and aren't as fortunate to be living in the Swiss Alps where the tap water is natural spring water, the Bobble will come in handy when you're out training and playing hard. In fact, it's even a more affordable alterative to using one of those household Brita filters which I personally have attached to my faucet. 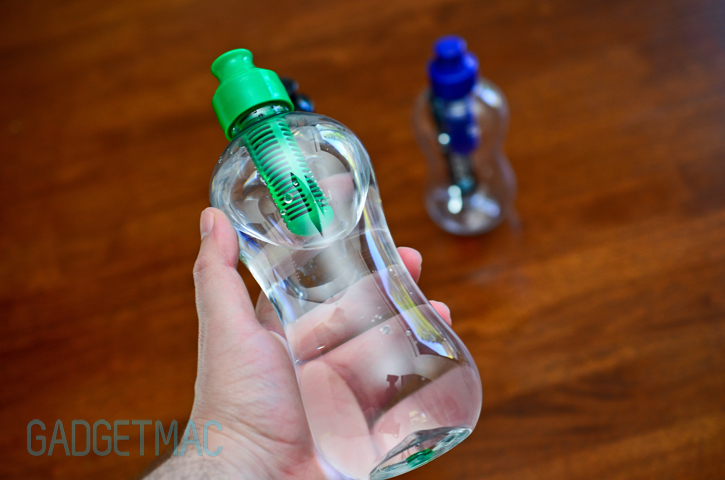 Brita also makes similar water bottles with their own filters, albeit with less style and without variety and options. The Bobble has a striking, beautifully sleek bobbleacious design that's made in the USA using PVC-free and BPA-free clear plastic. You can reuse it as many times as you'd like without having to worry about scary chemicals contaminating the water you drink over time. Bobble's Bobble water bottles come in a wide variety of fun colors, replacement filter colors and bottle sizes and even water jugs. Sizes range from Large 34oz/1L for $13 (that's the black version above), Medium 18.5oz/550mL for $10 and Small 13oz/385mL for $9. The large sized Bobble is really great to take when going on day-long trips while the smallest Bobble (blue) feels and looks like a baby bottle which will be fantastic for little children to use. Each Bobble comes with one pre-installed filter which is good for two month's of daily use which equates to saving around 300 bottles until it needs replacing. 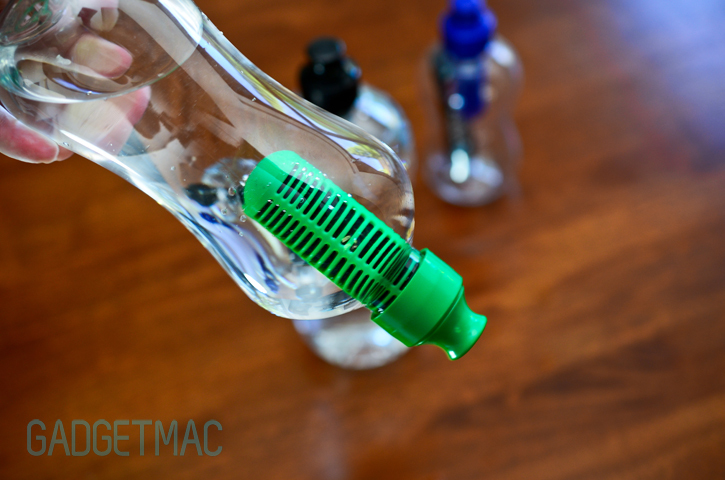 A Bobble filter fits any size Bobble bottle and costs $7. That's $7 every two months to maintain. The good news is that the filter assembly is actually the entire screw-on cap, so when you get a new filter you end up changing the cap as well. $7 for one filter is costly considering the filter nearly costs as much as an entire Bobble bottle. 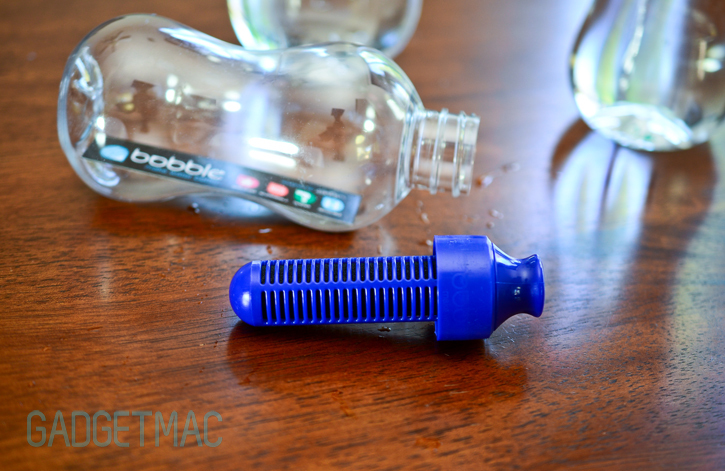 Price aside, the Bobble's filter isn't anything new and works exactly like any other carbon filter and required a one-time rinse in order to activate and get rid of any left over carbon dust that might be trapped inside. Don't worry though, you're not going to be some kind of a test bunny. Carbon is a natural material and can be ingested, although I would still make sure to carefully run at least two bottles full of water thru a new filter before use. 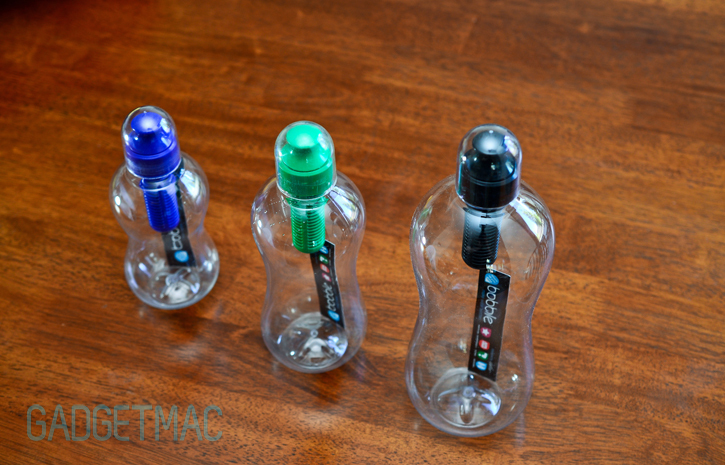 The Bobble promises to get rid of that bad tap water taste and smell, and so it does with flying colors. 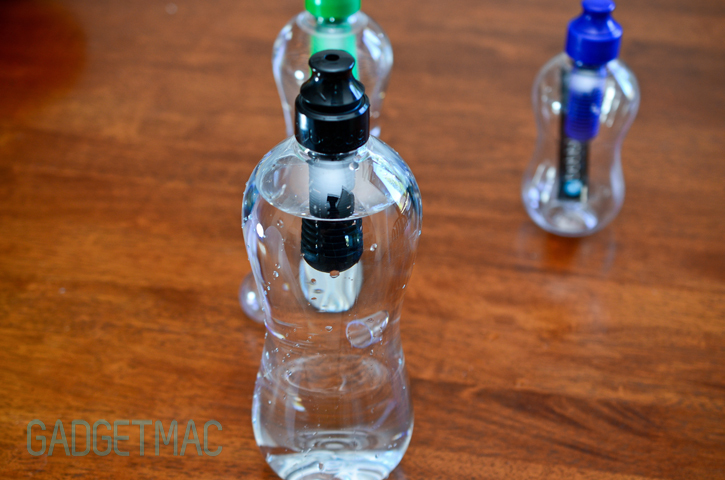 In our testing, we put the Bobble's filter to the test against filtered tap water using a Brita filter, natural spring bottled water and of course we used simple, unfiltered tap water. And just like that, the Bobble does an amazing job filtering the water as you drink and filters out that nasty metallic and chlorine taste and smell from the water. The filtered Bobble water tasted exactly the same as the Brita and natural spring water we put it up against. As for the tap water, well let's just say we are never going to dare drink. Using the Bobble is dead simple. 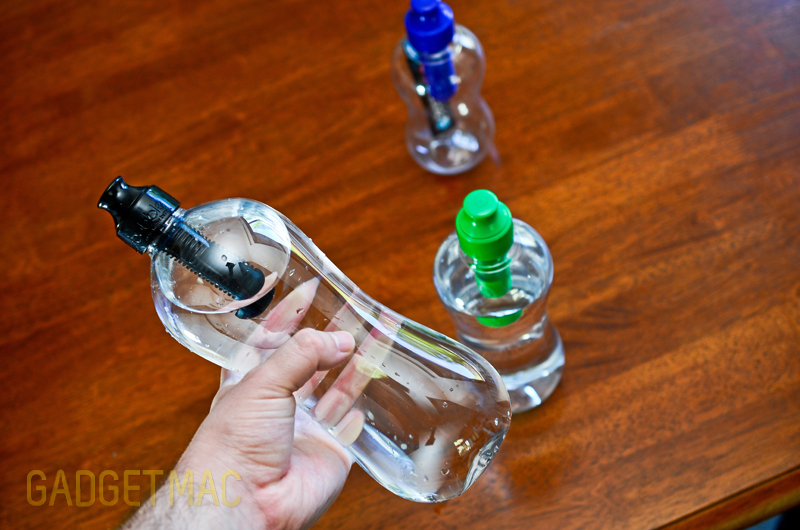 Pull the cap up to drink while you lightly squeeze the middle part of the bottle to let water flow thru the filter and out the end. Because the water does need to be force thru the filter and thru the push cap, drinking water from the Bobble does require you to force it out. Lastly, press the cap down to seal shut the Bobble. I love this type of drinking cap because it works so well and it keeps the water from dripping out when it's opened if you accidentally tip over the bottle. You do need to be careful not to squeeze too hard or else the Bobble's plastic will end up with a crease in it. Thankfully the plastic is BPA-free, but it'll look ugly nonetheless. 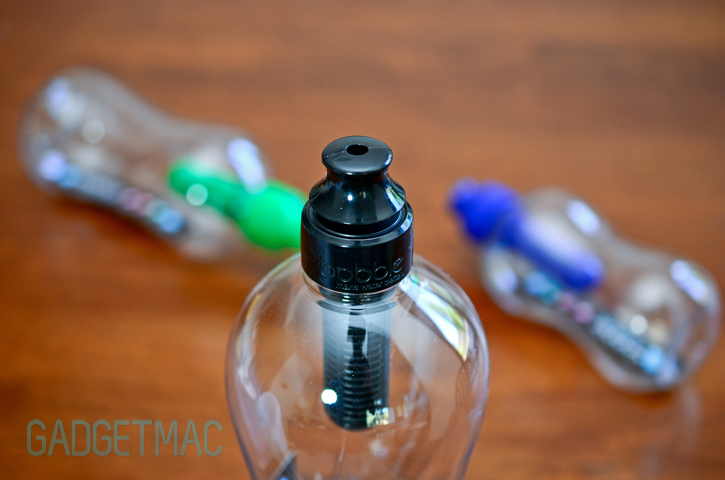 The Bobble comes with a protective clear cap that will help keep the drinking cap clean, but you'll end up losing it. Bobble did recently come out with a sportier version, albeit less appealing, called the Bobble 24/7 which features a grippy soft-touch finish along with a protective cap that's attached to the Bobble so you won't lose it. 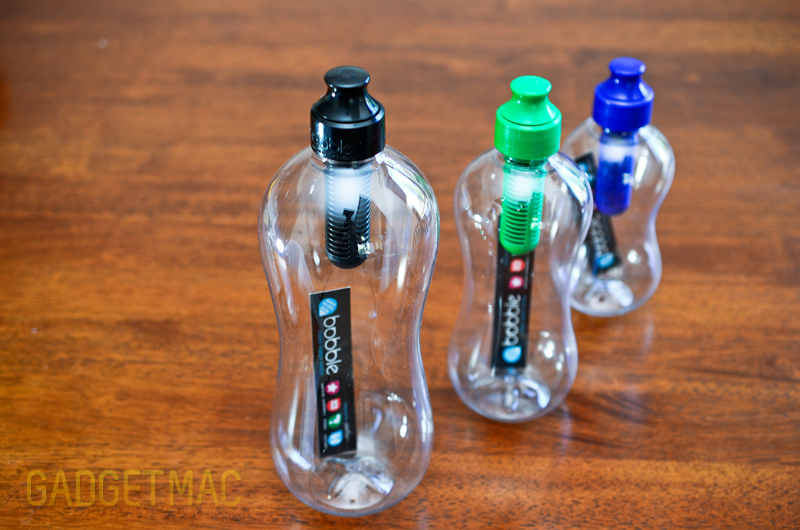 Some of the caveats with using the Bobble is that you cannot add any flavor syrups or powdered flavoring enhancements and vitamins to the water because of the carbon filter. You also can't use it to filter and drink water other than safe drinkable, municipal tap water. So don't try scooping up lake water thinking the Bobble has got your back. The Bobble water bottle is easy to use, works exactly as its advertised and effortlessly filters out bad chemicals and taste in tap water. We can't think of anything bad to say about it really other than Bobble's somewhat expensive replaceable filters. The Bobble is the most stylish filtered water bottle currently available, and we can highly recommend grabbing one if you find yourself constantly drinking bad tasting tap water on the go.